I am a romantic. I love flowers and chocolate and cheesy love notes. Sadly, my husband doesn't have a romantic bone in his body. 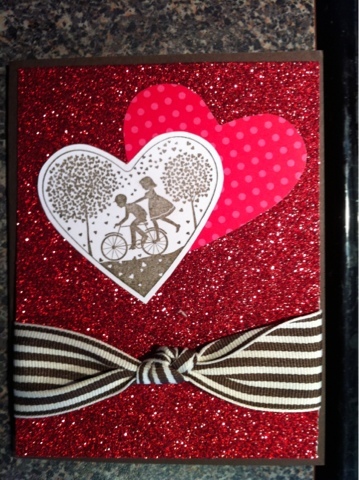 I created this beautiful card for him anyway with Take it to Heart from the Occasions Mini catalog. I used Early Espresso, Whisper White, Real Red DSP and of course our beautiful Red Shimmer Paper. Ink is Early Espresso and the ribbon is our 1 1/4" striped grosgrain in Early Espresso (now discontinued). I'm now following your blog. Very cute stuff.